On Sunday, May 18, the 103rd graduating class of St. Paul’s School will cross the stage to receive their diplomas. The Class of 2014 will soon be heading out all over the country to attend a variety of public and private colleges and universities. No longer will these students be the big fish in a little pond. With rising standards in schools all over the country, the Class of 2014 has done well to excel athletically, and most importantly, academically. For the 12th year in a row, St. Paul’s has received the Golden Achievement Award from Louisiana State University as one of the top 20 schools in the state with regard to the number of credit hours earned by SPS students at their annual spring testing. While the majority of students will be attending LSU in the Fall, students are venturing all over to schools such as Furman, Florida State, and even the prestigious Princeton (*cough* *cough* Zach Albright). Altogether, this year’s crop of graduates has been accepted into over 90 different universities and has earned over $11 million in scholarship offers. 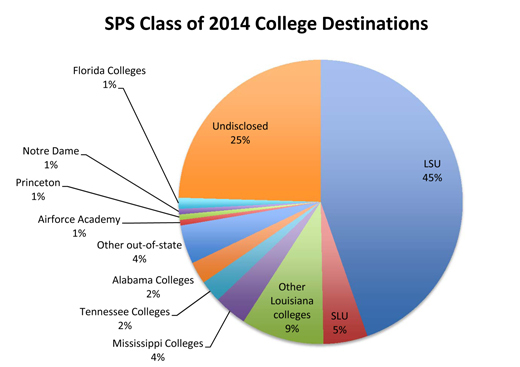 To show where the SPS seniors will be venturing after graduation, The Paper Wolf has compiled some data that shows most of the class’ destinations.